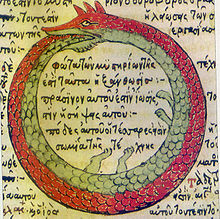 The ouroboros or oroboros is an ancient symbol of a serpent or dragon eating its own tail. The ouroboros symbolizes eternity or cyclicality. It is the sense of something constantly re-creating itself. Like the phoenix, it symbolises cycles that begin again as soon as they end. The first known appearance of the ouroboros motif is in KV62, the tomb of Tutankhamun, in the 14th century BC. The text is about the god Ra and his union with Osiris in the underworld. In an illustration, two serpents, with their tails in their mouths, coil around the head and feet of an enormous god (this the unified Ra-Osiris). The whole figure represents the beginning and the end of time. ↑ Soto-Andrade, Jorge; Jaramillo, Sebastian; Gutierrez, Claudio; Letelier, Juan-Carlos. "Ouroboros avatars: A mathematical exploration of self-reference and metabolic closure" (PDF). MIT Press. Retrieved 16 May 2015. ↑ Hornung, Erik 1999. The Ancient Egyptian books of the afterlife. Cornell University Press, 38; 77–78. This page was last changed on 4 July 2016, at 11:28.